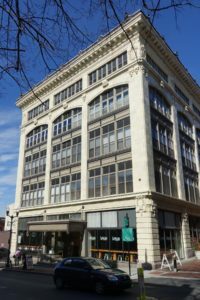 In 1910, the Hager family knew they had to do something radical if they were going to survive in the competitive Lancaster City department store business. Their claim to being the oldest continuously operating department store in the United States did not sufficiently impress consumers who were attracted to the new shopping experience offered by Watt & Shand. Additionally, new stores were being planned for M. T. Garvin and Reilly Brothers and Raub. Interestingly, the Hagers commissioned , C Emlen Urban, the very same architect that Peter T. Watt and James Shand had retained to reinvent their store a decade earlier! This time, however, Urban was able to take advantage of the benefits of structural steel construction, allowing for larger window openings and virtually column-free floor space. This revolutionary new construction method transformed the way buildings looked and performed. For a department store, this meant superior natural lighting to showcase merchandise and open floor plans for customer convenience. Urban was careful, clever and deliberate with his choice of materials to clad Lancaster’s newest building. He chose the traditional detailing associated with the French Renaissance Style to acknowledge the past, but melded it with modern details of the emerging Chicago Style. 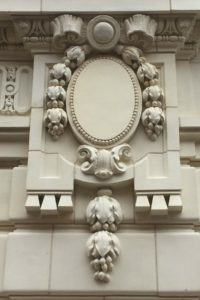 White glazed terra cotta blocks, ornate medallions, embossed metal panels, large plate glass windows and cast iron columns that were topped off with a decorative pressed metal cornice created an imposing presence on West King Street. Posted on June 29, 2018 by rlps.